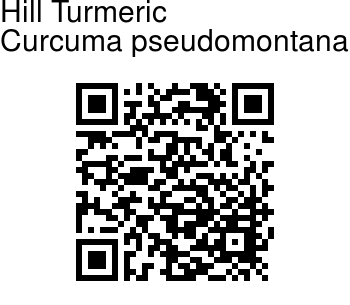 Hill Turmeric is an erect herb, growing to 75 cm tall, found on moist, shaded areas of wet forests and along sluggish grassy slopes of higher altitude. It has stout rootstock bearing small almond like sub-globose tubers at the ends of the_fibrous roots. The tubers are fleshy and white inside, aromatic. Leaves 3-5, oblong-lancelike, 20-30 x 6-9 cm, base acute, tip sharp, margin entire, hairless; shiny; leaf stalk and the leaf sheath up to 20 cm long. Flowering spikes seen in the center of the previously formed tuft of leaves, 10-25 cm long, bearing numerous compactly arranged flowers; flowering bracts conspicuous, inverted eggshaped to lancelike, 3-5 x l.5-2,cm, apex rounded to acute, hairless; gr,een with a pinktip. Non-flowering bracts (coma) oblong-lancelike, conspicuous, purple below and pinkish purple above. Flowers 2-4 in each fertile bract, bright yellow, 3 cm long and 4 cm broad. Capsules spherical, splitting by 3-valves, smooth. Seeds ovoid or oblong, usually covered with arils. Flowering: June-Septermber. 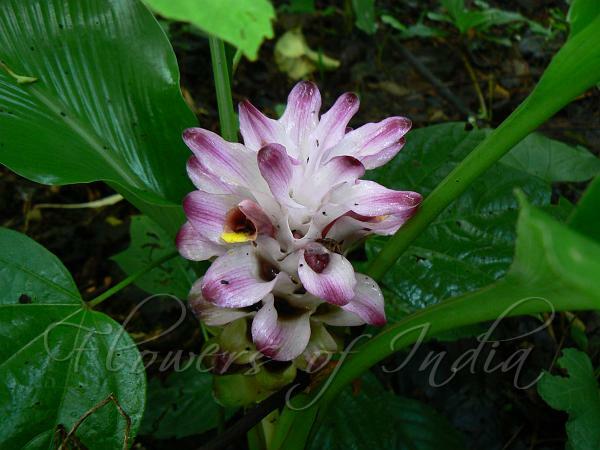 Medicinal uses: The Savara tribes in the Eastern Ghats of Andhra Pradesh use tuber extracts to cure jaundice. Jatapu and Kaya tribes apply warm tuber paste to treat body swellings. Women of Jatapu and Savara tribes eat boiled tubers to increase lactation. Khand tribes apply tuber paste on the head for cooling effect. Photographed in Bangalore & Maharashtra.